"Christchurch City Council want to get down with this puppet of Chinese Totalitarianism (what business in China isn't a puppet?) to take over the Lyttelton Port Company. No objections on grounds of free trade but Hutchison Whampoa is more than just a trader so it raises the issue of strategic defense. It's enough of an affront to libertarians that Garry Moore and the Christchurch City Council are using the taxation robbery game to fund business ventures, but that's not the only issue. I think we should do the deal with the tiger but remain vigilant, only when someone does cross the line and endanger national security should we respond. Meantime- watch and have that response ready to roll. But I'm not kidding about the vigilance stuff. Often the best and only time to kick somebody out is before they've ever gotten their foot in your door. 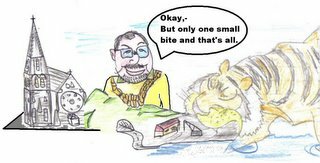 ps The tiger is an old tracing I did of a David Lowe cartoon. All artists are beggars and thieves...me especially."